Sometimes, you just get a feeling. Yesterday, our intern asked me what I thought the next big bag would be, now that the Celine Luggage Tote appears to have hit critical mass. I consulted my tea leaves (as one does, of course), and for some reason, Givenchy was the first thing that came to my mind, so that’s what I said. Hilary, our marketing director, chimed in that she had the same feeling. Neither of us could put our fingers on exactly why, but big things might be about to pop for Riccardo Tisci and Givenchy. Not that big things aren’t already going on, of course, but the atmosphere around the brand’s accessories seems to have shifted for the better recently. So what does that mean? I haven’t seen evidence of anything new and huge coming down the pipe from Givenchy, handbag-wise, but that doesn’t mean it doesn’t exist or that it won’t exist very soon. Alternately, perhaps one of Givenchy’s existing bags – my guess would be the Antigona – will start to catch on in a big way among people who can “make an It Bag happen,” for lack of a better phrase. I certainly loved it at first sight. Givenchy is exactly the type of brand that can produce a big hit. The money is there – Givenchy is owned by LVMH – but the brand is limited in its availability in a way that brands like Gucci and Fendi aren’t. It has the kind of limited distribution that helps make a bag seem rare and desirable; the only major US department stores that carry the brand’s bags online are Bergdorfs and Barneys. Inaccessibility is an important element in the making of a fashion frenzy. On top of the tangible factors, Givenchy’s brand image is perfect for the spawn of an It Bag. It’s a line for fashion people and style mavens, much like Celine, which gives its pieces an extra note of caché that’s extremely difficult to recreate in a line with a more “mass” draw. Givenchy, on the other hand, is a brand that the coolest person you know already wears, which gives Tisci a significant leg up when it comes to making a lust-worthy bag. Givenchy’s opportunity is ripe; I, for one, hope they seize it. What do you think? If not Givenchy, what brand do you think will make the next big bag? 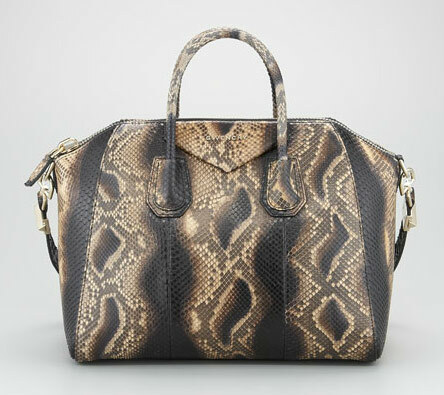 Buy the featured Givenchy Antigona Tote via Bergdorfs for $4770.